Renovate Europe Day held on 5th November showed buildings crucial for energy security, jobs, climate and growth. 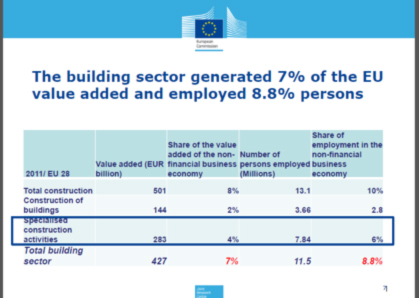 With this message the European Alliance of Companies for Energy Efficiency in Buildings (EuroACE) urged the European authorities to open their eyes for the huge advantages of deep renovation of the European building stock. "Capturing the multiple benefits of energy efficiency"
"When the building sector works, everything works"
Last October the EU Heads of State and Government agreed the headline targets on climate and energy for 2030. The cornerstone is the cut in greenhouse gas emissions by at least 40% by 2030, an EU-wide binding target for renewable energy of at least 27%; however for energy efficiency only an indicative target of at least 27% could be reached. In the Juncker Commission 2014-2019 energy efficiency is part of the new portfolio 'Climate action and energy' of new Commissioner Miguel Arias Cañete. His actions will be aligned to those of Vice President EU Commisison Maroš Šefčovič who's responsibility it is to reform and reorganise Europe's energy policy into a new resilient European Energy Union. 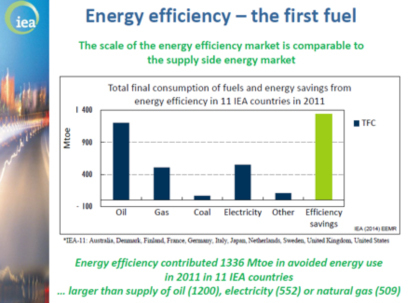 As scientific reports keep on demonstrating energy efficiency is the first fuel in energy security, ES-SO reaffirms strongly its ambitions to its energy efficiency commitments. In its next Newsletter ES-SO will report on its latest scientific study on "Cost Efficient Solar Shading Solutions in High Performance Buildings". ES-SO will celebrate its 10 years' existence with a full day seminar at R+T Stuttgart, the world leading fair of roller shutters, solar shading systems, doors and gates. In the morning session lectures of scientific guest speakers from Europe and U.S. will deal with topics on "From solar shading to solar control: solutions for energy efficiency, daylight management and healthy comfort in high performance buildings". In the afternoon session experts will present the latest "News on CEN standards for the solar shading industry". The venticool platform, launched in October 2012 aims to increase communication, networking and awareness about ventilative cooling to mobilize the untapped potential in terms of energy savings and improved comfort. ES-SO is a partner in this project and contributed to the Venticool position paper. The new WGBC report on "Health, Wellbeing and Productivity in Offices" presents overwhelming evidence that office design significantly impacts the health, wellbeing and productivity of staff. The report finds that a range of factors – from air quality and lighting, to views of nature and interior layout – can affect the health, satisfaction and job performance of office workers. Shading is part of the design of a green building office.